WASHINGTON, D.C. -- While approval ratings of U.S. leadership took a beating worldwide in 2017, some of the most serious damage occurred among the United States' NATO allies -- the same group gathered this week in Brussels. NATO countries led the world with the largest declines in approval of U.S. leadership between 2016 and 2017; Portugal posted a 51-percentage-point loss, followed by a loss of 44 points in Belgium and a 42-point drop in Norway. Kay Bailey Hutchison, the U.S. ambassador to NATO, said last week that the overarching theme for the summit this year is "NATO's strength and unity." Whether that will be on display or allies will see a repeat of the friction at the recent G7 summit in Canada -- or even last year's NATO summit -- remains an open question. President Donald Trump as recently as Monday criticized Germany and other allies for spending too little on defense. Last year's NATO summit did not do many favors for the U.S. image abroad. 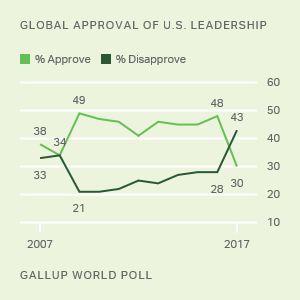 The timing of Gallup's surveys in 2017 mostly overlapped or followed the NATO summit in May and the G20 summit in July, where the rifts between the U.S. and its allies started to become apparent. U.S. leadership approval declined substantially -- by 10 points or more from the previous year -- in 18 NATO ally countries. Ratings dropped precipitously among longtime allies and G7 countries France (28 points), the United Kingdom (26 points), Germany (21 points) and Italy (14 points). Even so, ratings from many European countries were similar to if not worse than the current U.S. leadership ratings during the last years that President George W. Bush was in office. For example, in the U.K., where Trump will be spending much of his time while in Europe this week, the 33% who approved of U.S. leadership in 2017 was still 10 points higher than the rating in the last year of the Bush administration. However, disapproval was equal to the high during the last two Bush years. Still, the U.S. image did move in a positive direction for a few NATO members last year: Poland, Slovakia and Montenegro. Last year also marked the first time that a majority of Poles had approved of U.S. leadership, possibly reflecting lingering goodwill from the president's visit to Warsaw in July. In the post-World War II era, the U.S. has repeatedly leaned on its many powerful allies to assist it in affecting issues beyond its borders. However, as a candidate and now as president, Trump has repeatedly shaken the foundations of these partnerships, criticizing them on topics from trade to defense spending. Based on the free fall in approval ratings of U.S. leadership, the people in most of these countries have reacted in kind. They, along with their leaders, are also likely bracing for a contentious NATO meeting this week and are anxious about Trump's meeting with Russian President Vladimir Putin that follows. Results are based on face-to-face and telephone interviews with approximately 1,000 adults, aged 15 and older, in each country or area. Between March and November 2017, residents in 134 countries or areas were asked to rate U.S leadership. For results based on the total samples, the margin of sampling error ranges from ±2.0 percentage points to ±5.1 percentage points at the 95% confidence level. The margin of error reflects the influence of data weighting. In addition to sampling error, question wording and practical difficulties in conducting surveys can introduce error or bias into the findings of public opinion polls.